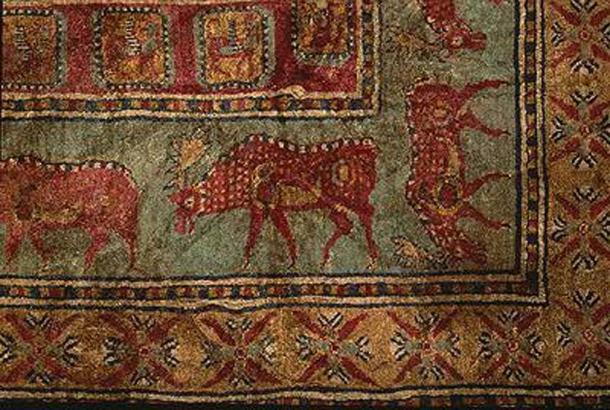 The Pazyryk Carpet is the oldest known example of a carpet in existence today. The Pazyryk tribe lived in the Altai Mountains in Siberia, south of the modern city of Novosibirsk, Russia. They were horse riding nomads and warriors, who traveled by horseback to trade goods with merchants in China, India, and Persia. Much of their culture has been revealed trough findings of a series of tombs found in the Pazyryk Valley, including mummified human remains with detailed tattoos, golden treasures, felt hangings, Chinese silk, pile carpet, wooden furniture and household goods, which were preserved over the millennia due to water seeping into tombs and freezing everything into solid blocks of ice. Human remains have revealed that the Pazyryk people were even carrying out advanced cranial surgery over 2,00 years ago. The Pazyryk Carpet has survived until today thanks to sheer luck. The burial mound where the carpet was found had been looted in the past. The grave robbers had taken all the precious contents within the burial, and the items considered to be of lesser value, such as the carpet, were left behind. The Pazyryk carpet is amazing, I have known about it for a few years from a book on the Hermitage, but I did not know what it was called. I think that you can see the influence of the manufacture on coins of Miletus, a textiles center. Particularly, the four-pointed "stars" at the bottom of the carpet, and the 6th c. BC obols of Miletus' reverses. Another point of comparison is the Assyrian stonework, imitating a carpet in the British Museum. One should realize that textiles must have been as big of an industry as pottery was. But, pottery survives, and textiles do not, (in general).